Official economic opinion from the IMF is that the US and the British are the only industrialised economies that are growing strongly and that their growth model should be reproduced generally. The reality is very different. Both recoveries are the weakest on record and are fuelled by an unsustainable (debt-fuelled) rise in consumption. The international effects of this are negative, acting to provoke further instability in the world economy. The Anglo-Saxon recoveries cannot possibly be widely copied without deepening crises. 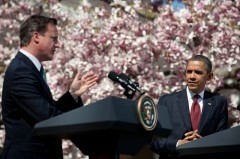 First, it is necessary to dispose of the myth that either the US or Britain is enjoying a robust recovery. In sharp recessions there is frequently a large amount of spare capacity in the economy as hours or jobs are cut and factories and offices lie idle or under-used. 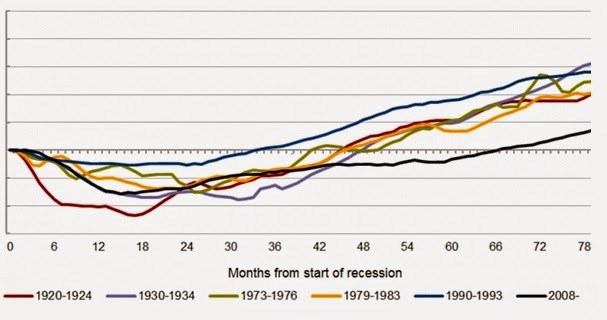 As a result, recovery from deep recession is often rapid. But that is not the case. Neither the US or British economies has accelerated beyond a 2.75% year-on-year growth rate in the entire recovery period. As a result, they are the weakest recoveries on record. The US recovery is the worst on record as it is also worse than the recovery from the Great Depression. But the performance of the British economy is worse still, significantly slower than any previous recovery phase. Recent trade data also demonstrates the underlying weakness and fragility of even these feeble economic upturns. The US recorded a trade deficit of almost $47bn in December and the British economy had a trade gap of £35bn for 2014 as a whole. These were, in both cases, a return to respective 4-year low-points. The US trade gap is on a sharply widening trend once more, despite the much lower level of oil imports because of the shale gas boom. 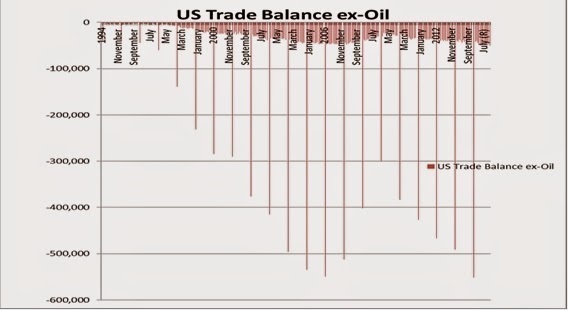 In real terms, after accounting for inflation, the US trade deficit excluding oil is at a record, as shown in Fig. 3. As a matter of logic the world cannot emulate an economy where the trade deficit is widening dramatically. The world cannot run a trade deficit with itself. Holding up the Anglo-Saxon recoveries as a model to be followed elsewhere is simply foolish, or overblown rhetoric which has no practical value in policy formulation. The same increase in effective net overseas borrowing applies to Britain where there are new record deficits on trade balance and on the current account (trade plus current payments overseas, mainly interest and share dividends). In fact the situation is qualitatively more grave for the British economy, for a number of historical and structural reasons which will be examined in a future post. For now it is enough to note that that a very mild British recovery is being funded by record overseas borrowing. The latest current account deficit is 6% of GDP, an all-time record. 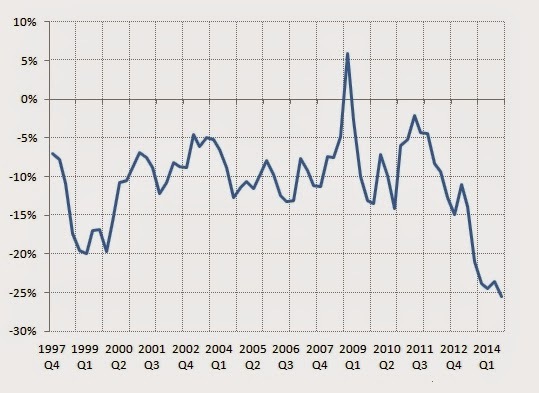 In effect the weak British recovery is being funded by unprecedented borrowing from overseas. Because this has been a continuous process, it has also led to an unprecedented deterioration in Britain’s international investment position. The continuous accumulation of new overseas debts has formed a record level of overseas liabilities, which is shown in Fig. 4 below. Both the US and British economies are uncompetitive even at previous exchange rates and are dependent on borrowing from abroad to fund recovery. But the funds they are borrowing from overseas are not being used to fund further economic expansion, via investment. 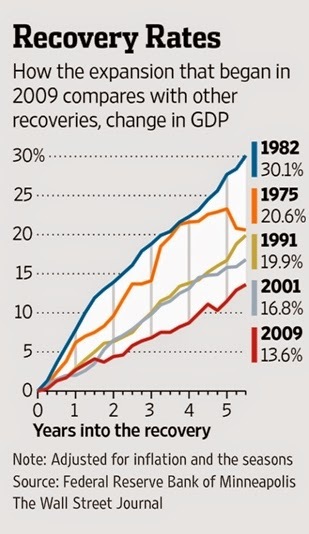 Instead the recoveries in the Western economies are almost exclusively driven by consumption. This is shown in Fig. 5 below, which shows the real change in both US and British consumption and investment since the recession began to the end of 2014 (Q3 in the case of the UK data). The data is shown in common US$ purchasing power parity exchange rates for comparative purposes. In real US$ PPP terms the US has increased consumption (combined government consumption and household consumption) by $1,064bn since the recession while investment (Gross Fixed Capital Formation) has increased by just $40bn. 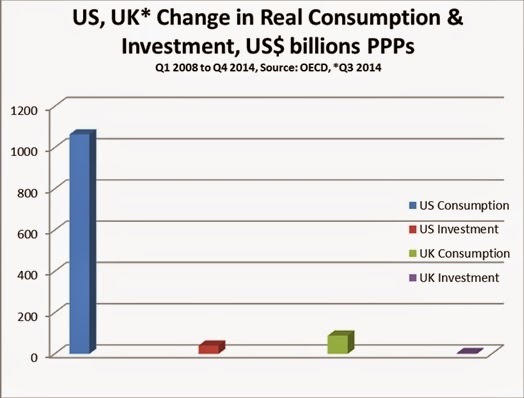 In Britain consumption has risen by US$88bn, while investment has increased by just $4bn. This belies any notion that the economies are struggling with the lack of ‘effective demand’. The weakness of the recovery and its dependence on increased overseas indebtedness is due to the virtual absence of growth in investment. Complete data for the major industrialised countries has yet to be published. But any growth at all for either the Euro Area economy or for Japan is likely to have been almost entirely driven by consumption with investment either flat or contracting once more. This is placing unbearable pressures on the rest of the world economy, the so-called ‘emerging markets’ and other non-industrialised economies. In part the rise in consumption in the industrialised countries is only possible because prices for basic commodities have fallen sharply. But it is also leading to capital outflow from poorer nations to richer ones, mainly the Anglo-Saxon economies to fund their increased consumption. This outflow of savings is preventing a rise in investment elsewhere, or significantly increasing the costs of that investment. This will both prolong and deepen the global economic crisis. The industrialised countries as whole led by the US and copied by Britain are consuming, not saving or investing. This produces weak and unsustainable growth in their own countries and is causing a global slowdown and further crises. Posted in: Economy, Investment, Macroeconomics. Good stuff and perhaps, as Wolfgang Streeck in the New Left Review argues, quantitative easing has only bought off the financial crisis for a few years and the levels of debt are unsustainable. Perhaps Neo-Liberalism with its drive for cheap labour has painted itself into a corner – restricting the ability of working people to purchase commodities, reducing the tax base and increasing the costs overall of welfare to subsidise low pay. Britain & The World needs a pay rise but the Right don’t want to upset their friends the bosses and I wonder if some sections of capital (oil, food) are currently willing to take a bit of a hit so the little that working people have may seem go a little further which they hope may restrict wage demands. Ann Pettifor argued here that Big Business in the UK is currently I think sat on something like £800b which it will not invest, “Probably for ideological reasons” and perhaps we need to get hold of some of this for long-term productive investment and Windfall Taxes of say £200b would probably start the job. We could also do with a Global Financial Transaction Tax which would make the financial sector pay towards the mess THEY created! I believe that the solution to the global economic crisis is to address global human need and for example we could make toilets for the 2.5b human beings in the World who don’t have access to them; working with international partners we could have global decent health services, better global health & safety at work, a global living wage, etc. etc. – hopefully as well as making economic sense just imagine how good all of this would make people feel. But it must be accompanied by other structural changes such as more democratic public ownership (by country) such as some banks with staff electing qualified boards and communities having a say. With democratic socialist imagination we could offer better services – publicly owned pharma where medicines meet human need and are cheap and people with severe conditions are not priced out by the market; some publicly owned airlines – with less seats and more space and comfort for passengers and crèches in the sky! I would also argue we need global shorter working weeks and earlier retirement to free ‘time poor’ working humanity and to free jobs for the young and perhaps this all makes more sense as driverless cars, trains, ships etc. are all on the horizon – we need to share the work out but of course we would need an economic system which served working humanity and not one that mainly serves the rich and powerful. I also have 2 further big ideas – free public transport run by local authorities (by country) which could attract people out of cars, help the transport poor, be more efficient, mean less stress on bus drivers, is more environmentally friendly, could mean safer roads, quiter roads, fresher air, and encourage more people to cycle, plus we could have couriers on board to help the public- but of course the capitalists may not like this as it could impact upon the car industry and profits. More solar panel farms in the Worlds deserts to harness the free energy of the sun which could help wean us of carbon and is more environmentaly friendly but of course while we attempt to impact positively on climate change again this could impact upon capitalist profits in certain industries such as coal, oil etc. We need to work with our sister democratic socialist parties globally to make such A Better, Fairer, Greener World our common cause. Yours in solidarity! Footnote – re solar panel farms in the World’s deserts. Syncronisity – an interesting piece in the latest New Internationalist- apparently in 1913 a scientist had the idea of a massive solar panel farm in the North African desert to meet the World’s energy needs. This idea has recently been revived and a Trust was set up in the 2000’s but the idea is currently on hold (one scientist argued that just 6 hours from such a massive solar panel farm’s exposure to the energy of the sun could provide the Worlds energy for a year!) But sadly it seems the Neandertholls have smelt profits. My idea is for solar panel farms in the Worlds deserts but run by a Global Democatic Trust which could be run by the UN via funding from Governments – why can’t the people of the Earth collectively own something good and love it – WHY CAN’T WE THINK BIG TO SURVIVE! ( a global equilalent of how we feel about the NHS) – we could give say 20% to the countries with the deserts and ring fence the proceeds to address global poverty, build good health services in developing counties (no more Ebolas!) etc. etc. Why can’t Big and Global be Beautiful! But sadlly it seems the potential carpet baggers hovver – THE LITTLE PEOPLE OF THE PLANET! I offer a a democratic socialist social enterprise solution to serve humanity, to meet global need, to address climate change. Yours in peace, love and international solidarity! I do not think this would even be considered now, a change in African Government and you would see the farms turned into a money making racket and why not, why should Africa again be seen as a benefit to socialist when everyone else will be making profits form it. Africa get pennies while the power companies and government makes millions. I do not think the idea of us using Africa would even be starting in my life time the sun maybe free but the cost of the world will not be.